This graphic organizer helps students organize their ideas in thinking about their novels. I've used it in Literature Circles to guide discussions and as a quick reading assessment for students who want credit for my class read-alouds. 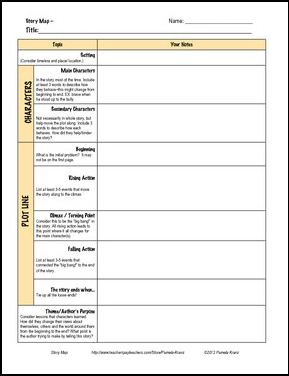 Story Map is part of 3-2-1BlastOff-Reading Resource Bundle, along with Author Study Newsletter, Series RAFT and more. © 2012 Pamela Kranz All rights reserved.